BLT’s are one of my favorite sandwiches, I just love the creamy freshness of it. I also love avocado so what could be better than adding a little California in it! Instead of a sandwich this is a great salad that merges these flavors together. I have to admit this is my spin-off of the recipe on the back of the suddenly salad box (sometimes I’m just too tired). I did try theirs but the mix is strange tasting to me and really all you need is ranch and a few fresh ingredients. If you want to kick it up add a little hot sauce. Refrigerate the dressing for 30 minutes to thicken before tossing it with the other ingredients. For a lighter and healthier version all you need it to just the Greek yogurt ranch recipe, turkey bacon and wheat pasta. Trust me you can hardly tell the difference. 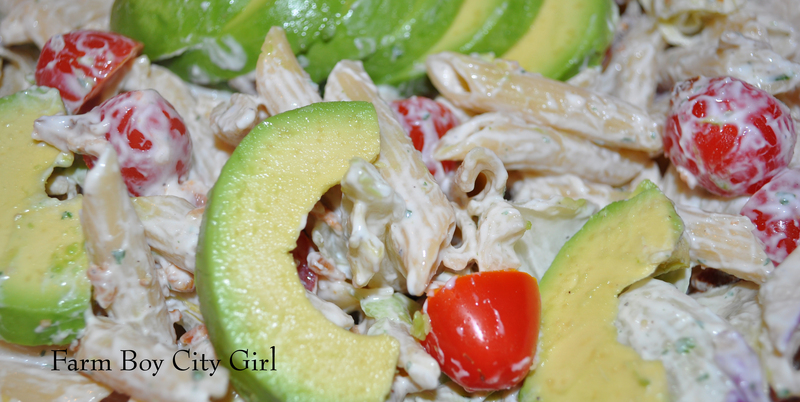 This entry was posted in Food and tagged Avocado, BLT, BLT with Avocado, California, California BLT, food, Good salad, Good summer salad, Greek Yogurt, ranch salad dressing, Salad, Sandwiches. Bookmark the permalink.